Game of Drones. John Bailey ASC on drone safety. Above: a photo I took of a drone at Cine Gear Expo 2012. Recently, I had a post that included spectacular footage of a fireworks show shot from a drone. The increase use of drones with GoPros has become both a safety and personal privacy headache. The Seattle Police Department recently spoke with an Amazon employee who flew a drone too close to the Space Needle. 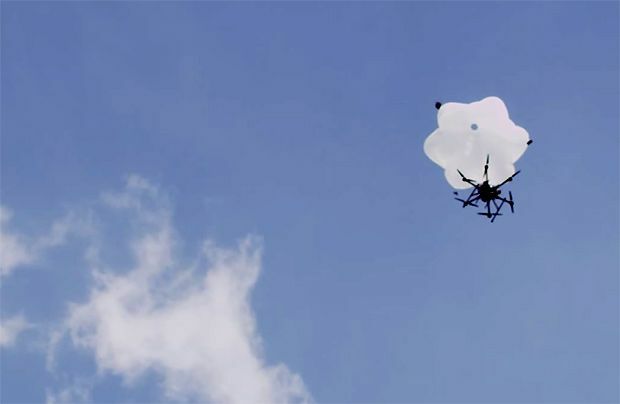 DJI has a new system called Dropsafe, drones that deploy parachutes. According to the Hollywood Reporter there is now a new organization called the Society of Aerial Cinematographers, prompted by the increase of drone use in movie and television production. John Bailey ASC, on his blog post called Drones, Drones, Drones, explains the many safety issues and FAA regulations about using camera drones. ….I found videos of out-of-the-box amateur drones taking to the air (even as their new owners were still reading instructions) and crashing into high rises in midtown Manhattan, then falling onto the street below, nearly injuring a pedestrian. …Just like the Steadicam before it, these small 4-rotor and 8-rotor drone helicopters mounted with HD cameras, from GoPros to Canon 5Ds, are quickly changing the scale of imagery that can be photographed for feature films. Many productions that have been unable to afford traditional piloted helicopters with sophisticated camera-stabilizing systems can now engage a two-person ground-based crew of pilot and operator to shoot sweeping images that “open up” a film. But that is only a small part of drones’ potential as a new camera system. Last winter, watching director Nabil Ayouch’s Horses of God, the Moroccan entry for the Academy’s foreign-film Oscar, I saw a shot that took my breath away. A group of boys are playing on a dirt soccer pitch in the Casablanca slum of Sidi Moumen. Everything is photographed at ground level, with long-lens panning shots intercut with wider-angle close coverage on the Steadicam to build up the action sequence. A very low-angle shot then follows several boys chasing the ball — and suddenly sweeps past them, rising above their heads to reveal the intricate warren of passageways in the slum beyond. The camera continues up higher for an overview of the slum and of downtown Casablanca. It is a stunning moment because it comes at the end of an eye-level sequence. It also sets up the disjunction between these still innocent, poor children playing soccer in a trash-ridden, dusty lot—- with the indifferent modern city nearby. The film climaxes with a sequence set years later, in May 2003, when these same boys, now trained suicide bombers, simultaneously blow up several buildings in downtown Casablanca, killing themselves and 33 people. This single camera move, made with a small HD camera on a drone, set up the visual and narrative flow for the rest of the film.